This uniquely shaped incalmo wallbowl is made from 6 separate sections. Incalmo is an extremely complex technique where each section is made separately and then they are joined one at a time while the glass is still hot. The outer section features an End Of Day® color mix, meaning it is made with a variety of colors used throughout the day and contains nearly every color in the rainbow. Moving inward next is a band of lovely purple and an elegant band of clear, then a luscious band of aquamarine with white highlights and another elegant band of clear, and the center is another End Of Day® color mix hypnotically swirling towards the center. This wall bowl can be hung on a wall just like a picture, or it can be set out as a table platter. To hang the bowl on a wall, all you need is a secure hook on the wall and a hanging apparatus comes along with the bowl. Hanging the bowl is a breeze and should take less than 10 minutes. 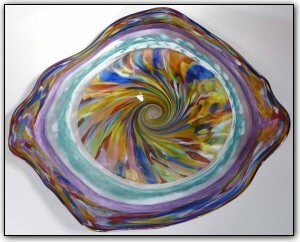 You won't believe the compliments you are sure to receive when displaying this stunning one-of-a-kind wall bowl!